After I post this article, I am tempted to vanish from the face of the internet, leaving folks to spend years speculating whether there is symbolism in the 13th article on Q Prophesy having some obscure relationship to the 13 Illuminati bloodlines, but alas – and much to the chagrin of the critics – my encodings are much more subtle than that. Having peeled away a half-dozen layers of the Q Phenomenon, examining the nuts and bolts of how it works, and speculating on why it is being deployed, we turn now to the ever-morphing prophesies of Q. This would be as simple as shooting fish in a barrel but that so many people have fallen for this simple trick – used by carnival “mind readers” for centuries. I highly recommend Steve Martin’s greatest film performance in Leap of Faith, co-starring fellow Texan Meat Loaf, as a primer for what follows. As author and researcher Joseph P. Farrell has often said, when you control both the prophesy and its interpretation, it is easy to control its fulfillment, as well. Keep in mind that my Q source is qanon.pub, the widely accepted resource for Q-vians, and that Q is allowed to speak for itself. I have not edited or amended the Drops in any way on the screenshots, and only noted a grammatical error on the copied text. Let’s begin, as all good stories do, at the beginning. Hillary Clinton will be arrested between 7:45 AM – 8:30 AM EST on Monday – the morning on [sic] Oct 30, 2017. 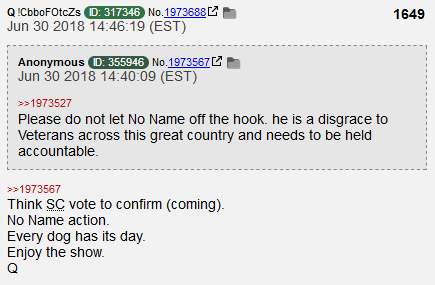 This post precedes Q taking on its current name, but subsequent “drops” have referred back to this and other early posts, so we can assume that this is the actual Q writing. Every internet search, and I am fairly proficient at Boolean search strings, has turned up circular references to this drop. There are exactly zero “mainstream” references to Clinton being arrested on 30 October 2017. There are zero references to National Guard and military deployments at that time (though they were activated in the wake of Hurricane Maria). There are zero references to rioting in the streets. There are zero reports of Clinton’s travel being restricted, and in fact she subsequently went to India and New Zealand, among others. Both Q and its supporters will point to Clinton wearing a surgical boot in December of 2017, as proof that she was arrested and tagged to prevent flight. They further point to Clinton wearing an arm cast in March of 2018, saying both these incidents show she was hiding a GPS tracking bracelet as part of her arrest and arraignment. It could also be that the Q social network model (see The Silence of the Q) thought that this post would be the best way to gain attention quickly, then it could switch from 4chan to 8chan claiming to have been hacked, thus distancing itself from this early, and apparently wildly wrong prediction if it became a liability. While I admit that Boot & Cast is a plausible scenario, it is much more likely that the US narrowly avoided electing a president who is quite sick and has trouble navigating independently. I, for one, would be gratified to see Clinton arrested and tried for her crimes, but I am far more likely to believe court dockets and orange jumpsuits, than anonymous posters in usenet groups with unfounded speculation on medical devices. We will call this one a FAIL for Q.
Q then moved to 8chan, or InfinityChan however you please, and began its meteoric rise through the internet Blab-o-sphere. It has since made all sorts of claims and predictions (1,931 posts as of this writing), usually ex post facto, regarding a great number of events. I call this the “shotgun approach,” in which a carnie makes a slurry of predictions hoping one will hit something. Generally, people will remember the hits and gloss over the misses because of the seemingly sensational nature of the hit. There are numerous expositions of this technique at work, some of the best of which were done by Harry Houdini and James Randi. Q tells us that “future proves past,” thus any occurrence that fits the parameters of the predictions can be said to “fulfill” them and so be a “proof” that Q has inside knowledge of events. It’s the same thing as a carnie saying, “My spirit guide tells me that someone lost a close relative in the past few months.” The woman leaping out of her chair yelling, “That’s me!” becomes the “mark”. Most of the predictions, unlike the one we previously reviewed, do not contain specific dates and times, nor even specific details. This is akin to me saying that on some day in the near future, the Sun will rise, and when it does I claim that it is proof of my paranormal ability to “see” future events. The way I word predictions can lead the observer to infuse meaning into supposed fulfillment, which is a common technique used by Q. The reader will recall that on 16 August 2018, three, four or was it nine planes were forced to make emergency landings in South America due to bomb threats. Immediately, we have a problem in that there are three different versions of the story, with three different counts of the number of flights affected (3, 4, 9). The same day (16 Aug), Q drops #1919. 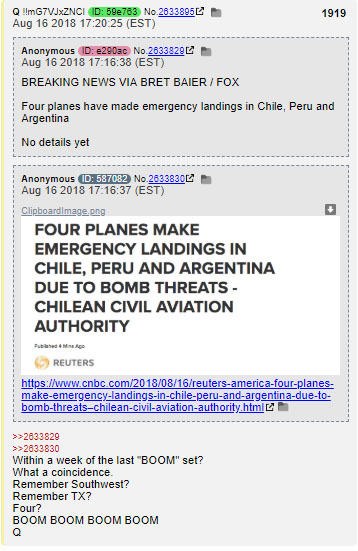 Q claims that it was four planes and the event happened within a week of it posting four “BOOM”s with the note [next week] (QDrop 1846, see below). There was no mention of Russian media reporting nine, nor of Fox initially reporting four, but the next day dropping the count to three. 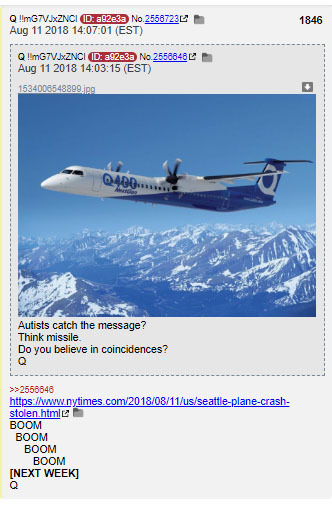 Furthermore, QDrop 1846 appears to be referencing the stolen Q-400 at Seattle’s SeaTac airport and makes no mention of bomb threats, airplanes (other than a photo of the stolen craft) or South America. The post says something about “next week,” which could possibly be interpreted as a reference, though it was six days prior, not seven or more. It was posted on Saturday, 11 August 2018, and Thursday, 16 August 2018, was technically “next week,” though the word “boom” to me implies actual explosions and not threats. In addition, a ten-year-old with a voice synthesizer could phone in bomb threats, much less the NSA and Q. If we suppose Q needed a “proof” at that particular moment in order to have the most impact on its network model, who’s to say it wouldn’t take care of the matter itself? We have absolutely no idea what Q is capable of doing in order to achieve its ends, since we know absolutely nothing about Q outside of what we have been told by Q itself. There was also no mention in subsequent Q Drops about the shifting number of planes affected, nor have any of the apologists made mention of this fact. It was dutifully reported as a “proof” and everyone moved on. This is generally referred to as “confirmation bias,” and we all suffer from it to one degree or another. If we believe that Q is an insider, then anything – no matter how vague – that confirms our belief is enough, especially if our peers also confirm this belief. To be sure, there are no other Q Drops up to two weeks prior to the planes being forced to land that had four “BOOM”s in them, so we must assume that 1846 is the correct reference. This is also the post that the Q-vian apologists referred to, so we have two confirmations – one from Q and one from the accolytes. Therefore, we conclude that this, too, is a Q FAIL at best, and a self-fulfilling prophesy (MIHOP) at worst. Our final example is also a recent one and is cited in comments on this blog, as well as the beginning of Q’s foray into the realm of secret societies. For background, the reader will want to brush up on the Skull & Bones society at Yale Univeristy, and note particularly the number 322 in the group’s emblem. We will also rely heavily on analysis by SerialBrain2, widely accepted as a leading decoder of Q Drops (Reddit is censored in Indonesia, and may be elsewhere; optional links are provided). Skull & Bones is an actual secret society that has existed since 1832, at Yale. A significant number of political and business leaders are/were members of this society. These are facts and are not disputed by anyone, including the members. What effect they have had on American history is a matter of volumes of research and speculation. We will not concern ourselves with that in this article. With all the qualifiers and disclaimers out of the way, let’s take a look at the Trump Scotland Incident and the Q/SerialBrain2 interpretation of it. 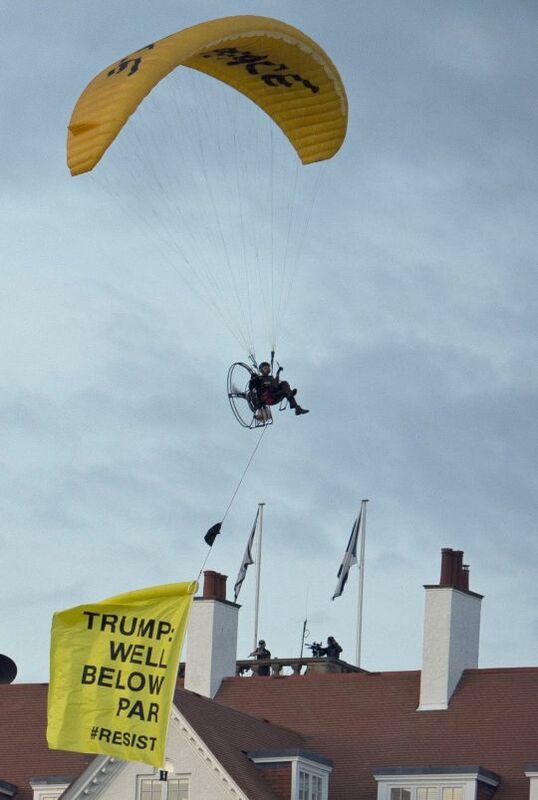 On 13 July 2018, a 55-year-old man with reported connections to Greenpeace used a paraglider to fly over Trump’s Turnberry resort in Scotland while Trump was there. During the glide, the man unfurled a banner that read, “Trump well below par #resist.” The man was later arrested without further incident. Two days later, Secret Service agent Nole E. Remagen died of a stroke while on Trump’s security detail in Scotland. This trip culminated in the Trump-Putin summit in Helsinki, Finland. These are the facts, now for the interpretation. As noted in my previous article, “The Twilight of the Q,” the number 23 plays heavily into Q Lore, showing up in mid-June in a Q Drop where “-23” was enigmatically inserted in the header of the post. This number was the center of much speculation among the acolytes and watching any number of YouTube videos around mid-June will bring up discussion about 23. Later, at the Helsinki summit, Q/SB2 noted the famous chess move called “American Beauty,” in which an American master beat a Russian master after sacrificing his queen (Hillary Clinton) in the 23rd move. It should also be noted that 23 is the reverse of 32, the first two numbers in the Skull & Bones logo above. Note further that none of the Skull & Bones material showed up, with all the 23s, until just the past couple of weeks. Q did not mention Skull & Bones until after the acolytes broached the subject. Nor has anyone I’ve found noted that in gematria, the number 23=W, the common nickname of George W. Bush, 43rd president of the US and a notorious Bonesman. I take sole credit for this one. A link is made by Q/SB2 based solely on ages between the Greenpeace activist (55 years old) and Jeffrey Boyd (also 55 years old), a man from Oklahoma, USA, who was arrested in Pennsylvania 1 August 2018, for threatening to kill Trump and family. 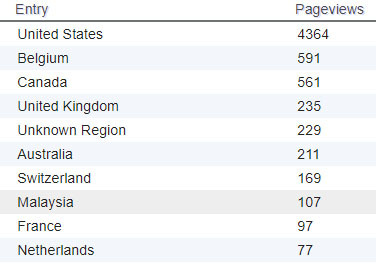 Of course, Pennsylvania is abbreviated PA, which is 16+1=17, and 17 is Q. It would seem to me, following the rules here, that Q was responsible for Boyd’s actions and signed it with its gematria. Q/SB2 label Boyd an MK Ultra victim without any evidence that I can find. 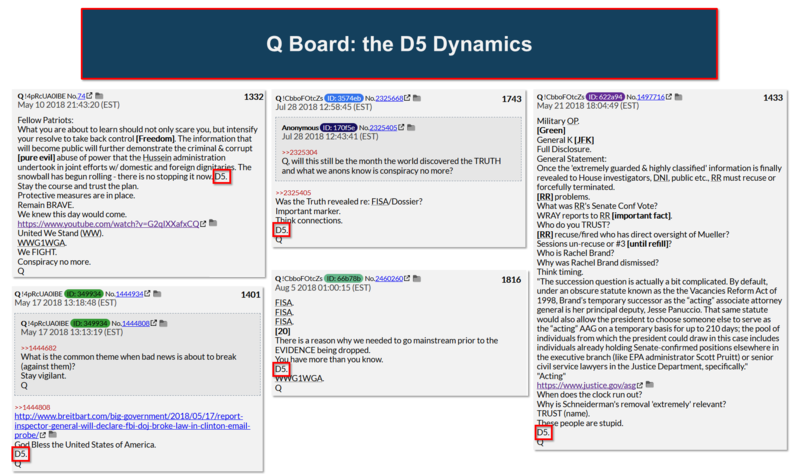 In an earlier post, Q/SB2 claim to have uncovered something called the “5D Network.” D, of course, is the 4th letter of the alphabet, so it can be read 54 Network, with 54 being the mirror of 45, and Trump is the 45th president of the US, thus the 5Ds oppose Trump (mirror). I leave it to the reader to take this as one will. Boyd was arrested with a .45 caliber handgun (4+5=9) and 2 rounds (1+1), thus this incident becomes an indicator towards something having to do with 9/11 being a false flag operation. Again, the reader will do with this as one pleases. Please note that I am reporting, not speculating – at least on my part. What I am relating here is the “decoding” done by Q/SB2. At this point in SB2’s post, it goes into several torturous paragraphs where comments made by Trump are added, subtracted, ignored and re-arranged following some unspecified rules of “English Ordinal Gematria,” to show how Trump is confirming he is in cahoots with Q through 2 minutes of seeming gibberish during a speech (shadow language). Then back to the para-glider in Scotland…remember him? 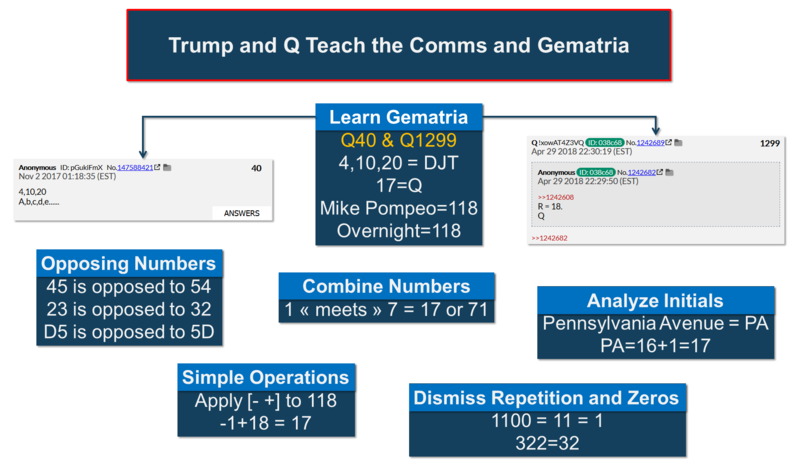 Through the use of gematria, SB2 derives the number 322 from the para-glider’s banner, “Trump well below par #resist.” This is, according the SB2, a reference – even signature – of Skull & Bones on the demonstration. Furthermore, the death of the Secret Service agent is seen as a calling card, much like the horse head in The Godfather movie. It should be noted that no proof of this is given, nor is there any speculation on Q/SB2’s part how this was achieved. Assuming that Trump’s rambling remarks were coded communications, SB2 tells us that 322 can also be noted as 32, and that mirrored is 23, which ties back to chess games and summits. If you add 23+32, you get 55, which were the ages of both the para-glider and Jeffrey Boyd. So at this point, SB2 tells us, we are to assume a “war” between Q/Trump and the Skull & Bones society. SB2 goes on to tell us that Hitler was a Skull & Bones product to create both a war to funnel money into their pockets, and a means to take over the world. In other words, Bonesmen started, benefitted from and ultimately won World War Two, thus initiating the Cold War. The proof for this claim is a fair amount of fidgeting with numbers and letters, and an economist named Anthony Sutton. Please refer to SB2’s post to understand this connection. Q, Trump and the global nationalist movement are given as the result of the collapse of the Soviet Union, the re-emergence of Orthodoxy in Russia and the election of Vladimir Putin, which brings us right back to the Helsinki summit and Russian collusion. And finally, we come back to a Secret Service agent named Remagen who died of a stroke in Scotland. The Battle of Remagen in March of 1945, was a key win for the Allies and allowed them to cross the Rhine river and advance on Berlin from the west n a pincer effect with Russia closing in on the east. What are the chances? A Greenpeace para-glider (green=money as in “no peace without our green”), an agent named Remagen (bridge to meet the Russians), a trip to meet Putin, and a dizzying amount of gematria. The final piece is back to QDrop 1846 mentioned above. Q/SB2 seem to imply that the theft and crash of a Horizon Airlines Q-400 is yet another threat/message to Q/Trump, or was it? Maybe it was a response by Q/Trump and in fact there was no one on the plane. The pilot mentions at one point having learned how to fly from “video games”. Could it be a codes reference to remotely flying the craft? It all gets rather fuzzy after a while. So why this long, convoluted trip through prophesies and gematria? It is vital that the interested reader understand the vast amount of information flying around Q (pun intended). With nearly 2,000 drops containing hundreds of explicit/implicit “predictions,” Q is bound to “hit” something, and with the acolytes filling in the meaning and confirming the hits due to confirmation bias, Q can be said to have deep access to covert information and activities. Basically, just about anything can be read into Q Drops and current events. Throw in some gematria and shadow language for a hint of mystery, a few unfounded assumptions with scant evidence, some interesting coincidences interpreted as fulfillments, and cover it all with a blanket of religious symbolism and fervor and you end up with the Q Phenomenon. Go to a roulette table, bet black/red, both greens and cover four corners on every number and you will hit something. I am not here to judge the veracity of this information. I present it as it appears in the Socio-sphere and note that there are several ways to view and achieve these results. These are the things that have so many people flocking to the ranks of Q-vians. Every good psy-op contains a large amount of truth, and certainly there is plenty in the Q Lore – more than enough to cover the outright lies and failures. So many people have become so desperate to remove the boot of tyranny from their throats that they will follow anyone – or anything – that whispers hope in their ears. We have seen this scenario played far too many times throughout history to not be alarmed when similar events take shape. I have endeavored to peel away the layers of Q, back-engineer its inner workings and place it in an objective position to look critically at it. David Copperfield made the Statue of Liberty disappear, and even though our rational minds tell us it’s still there, we are still amazed. I cannot say where it goes from here, but I can ask the reader to take a breath and think for a moment about what is becoming a serious underground political movement that claims for itself that it is a war, and wars have a way of exceeding boundaries. And now I have said my piece with a fitting nod to the 13 bloodlines of the Illuminati. What will you do with this information? While you consider your answer, remember that someone this very moment is working on the Anti-Q. P.P.S. – New development 27Aug18. This one is rather disturbing. Please note all details that I have listed, as well as every detail in the “drops,” including dates and times of postings. It should be noted that McCain announced his cancer almost as soon as Trump took office, and that he never displayed any of the usual signs of cancer treatment, such as hair and weight loss, sickened appearance or any medical devices (IV ports, etc.). In fact, he looked and acted quite well up until the family announced he would stop all treatments the day before he died. 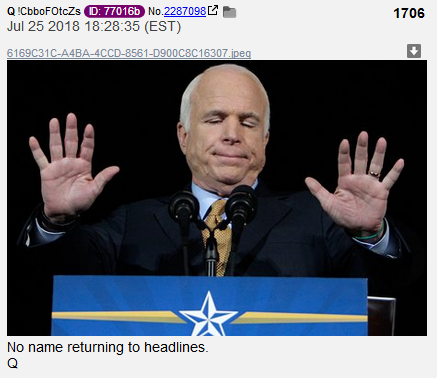 Q suggests that McCain committed suicide and makes several references that seem to indicate that this was known to Q at least a month prior, and that the exact date and time (ref. 30 and 0:28) when it would occur. The Rommel Option is the term for the choice Field Marshall Rommel was given for his role in an assassination attempt on Adolf Hitler – trial and hanging or suicide. So? Did McCain have a natural death, and if not, was it planned at least one month ago, and possibly one year ago? And was Q aware of the details and perhaps involved?